with his permission :D. so go visit his site! Combattler V, Voltes V, and Daimos are also known as the "Nagahama Tadao Romance Robot Anime Trilogy". They were created by Tadao Nagahama, one of the best super robot anime creators in my opinion. Not so many recognize him because of his early departure...he worked very closely with Yoshiyuki Tomino, the creator of Gundam, and other real robot anime like Ideon, Dunbine, and L-Gaim. 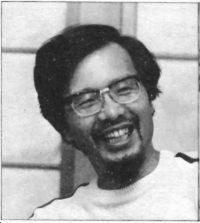 Tadao Nagahama worked with anime such as Kyojin No Hoshi, and the later half of Yuusha Raideen (the first half was done by Yoshiyuki Tomino), which lead him to create the trilogy Combattler V, Voltes V adn Daimos. Afterwards, he worked on the first half of Daltanias, and later went into work on Rose of Versailles and Ulysses 33....he passed away after completing the first episode of Ulysses 33... His anime always had a very dramatic effect..and of course, some of the heavy stuff concerning slavery and prejudice between races...etc. "Up until now, when it came to robot anime, the battle scenes were its sales point, and the story concluded in one episode. Voltes V was a creation intended to go beyond that. I wanted to get behind the perspectives of the enemy to express their psychological aspects to the audiences. I also wanted to create some sort of blood relationship between the hero and its enemy. Previous animes have never dealt with social themes but in Voltes, I have presented a situation where there was prejudice between those who had horns and those who didn't. And I wanted to intigrate that situation into this epic saga. This work delves into the lives of different people. Since Prince Heinell's character was well written, it was possible for the audience to see things from his perspective. But that is not enough, take one step further. La Gour was enslaved because he did not have horns. What would have happened if he didn't stand up for his cause? He risked his own life to fight for his cause, believing that there should be no slavery among their people. La Gour's agenda for life is just as worthy as that of Prince Heinell's. This work requires a lot of thinking from the audience. It would be grateful if this work be given some thoughts and applied to your own lives." The artist who originally designed the characters and Voltes V's mecha is Hijiri Yuki. He is very popular for the manga Choujin Rokku, which he currently still has been running on weekly manga magazines in Japan. He also designed for Combattler V and Daimos.